Born in a northern town in Kazakhstan, Central Saint Martins graduate Abzal Issa Bekov grew up observing his mother’s craftsmanship, who was a seamstress during the USSR era. 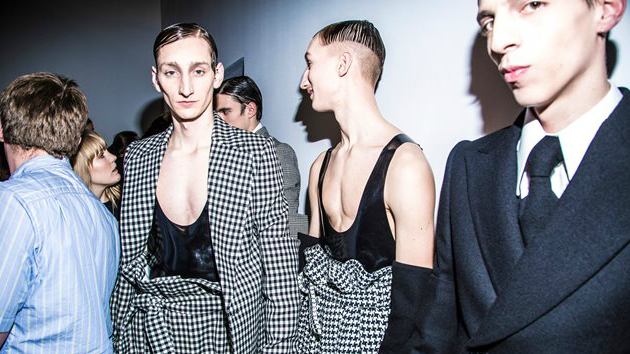 This is perhaps why fundamental tailoring is so important to the London-based designer, his breakout student collection recalling tradition and subverting time-honored silhouettes through an underground queer lens. Abzal was the first designer from Kazakhstan to have a collection open the Central Saint Martins MA graduate show at London Fashion Week. His collection was a subtle juxtaposition of Savile Row discipline and ’70s kink culture, revisiting the legacies of British tailor Tommy Nutter, praised for his iconic check suits, and photographer Robert Mapplethorpe, known for creating charged black-and-white imagery. At Mercedes-Benz Fashion Week Almaty his catwalk presentation will be the closing show. He will also present an advisory session on the topic 'We have nothing to say and we still saying it'. Speaking about his studies at top design schools such as the Parsons School of Design in New York and Central Saint Martins in London. Joining Abzal is stylist Pierre-Alexandre Fillaire, Assistant of Lady Amanda Harlech and Chris Sutton since 2015. He will speak about ‘Building ones identity’ looking at the intersection between style and identity across historical and contemporary contexts.